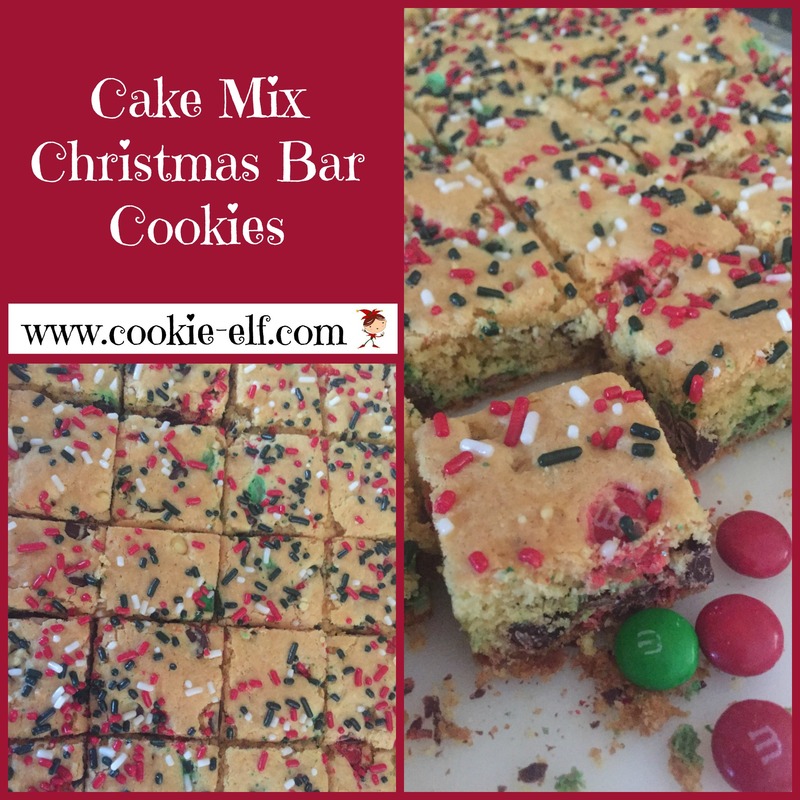 Cake Mix Christmas Bar Cookies: Just 6 Ingredients! What’s also so awesome about this recipe is that you can personalize it when it comes to the cake mix flavor, the additions, and the decorations on top. I make the bars with ½ cup holiday M & Ms and ½ cup chocolate chips but you can alter that to what you have in your pantry or what you like better when it comes to taste. And choose what color or variety of sprinkles, nonpareils, or cookie decos to sprinkle on top to make these cookies your own! Preheat oven to 350°F. Line a 10 x 13 baking pan with aluminum foil, allowing ends of foil to extend over two sides of the pan. Coat the foil lightly with non-stick cooking spray. Set the pan aside. Set the cake mix and pudding mix in a medium bowl. Add water, oil, and eggs. Use an electric mixer on medium speed to combine the mixture until all the dry ingredients are absorbed. Fold in chocolate additions, mixing only until they are distributed evenly. The dough will be thick. Drop dollops of cookie dough into the prepared baking pan. Use an angled spatula (also called an offset spatula) to spread the dough evenly in the pan. Sprinkle the cookie surface with sprinkles (optional). Bake the bars for 20-25 minutes. Do not over bake the bars. Remove bars from the oven just as the edges begin to turn golden, before the cookie surface or edges begin to turn brown. The middle of the bars may look raw, but the bars retain heat and continue to set after they are removed from the oven. You can replace the yellow cake mix with a white cake mix or a chocolate cake mix. Since the dough is so thick, you might have better success adding chocolate candies and chocolate chips with a large spoon rather than the electric mixer. See more cake mix cookies on our Cake Mix Cookies Pinterest board. Chocolate Cake Mix Bar Cookies: just 6 ingredients! Pecan Pie Surprise Bars: easier than pie!